© Copyright 2004 by AOK Corral Craft and Gift Bazaar All rights reserved. Tips: When selecting flowers or greenery to press, use flowers that are thin and delicate. There cannot be any large seed pods or woody stems. The flower must dry as well as press. Also, pick many light colored flowers because you will find that most of them darken up considerably through this process. Arrange flowers about 4 to 5 on a page in a large text book. 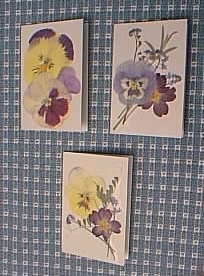 Arrange your dried flowers the way you would like them to look when the card is finished. Notice which pieces you have placed in the background and which pieces you have placed on top. Now take them off of the card. Start with the flower or greenery that you want in the back of the design. Then stick the flower or greenery on the glue. Continue gluing the flowers and greenery onto the card, working toward the foreground. Open the card out flat and cut a piece of contact paper that is 1/2 inch larger (on each side) than the card. Lay the contact paper on a table (sticky side up) and carefully set the outside fold of the card down, centered on the contact paper. Do the same with the back side of the card and you should have Step 1, pictured at above. Step 2, fold in two opposite sides of the contact paper toward the inside of the card. As shown in Step 3, cut off the overlapped corners of contact paper. Then lastly, Step 4, fold in the other opposite sides of contact paper toward the inside of the card. © Copyright 2004 by AOK Corral Craft and Gift Bazaar. All rights reserved.